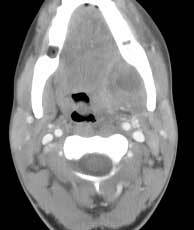 Findings: Irregularly enhancing mass (a) with foci of low attenuation in the left submandibular space. 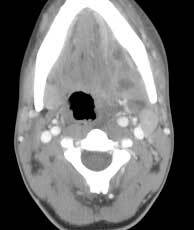 Fullness in the left parapharyngeal space (pps). Soft tissue in the expected locations of molar teeth (b) in the left and right aspects of the mandible. Sublingual glands (slg). 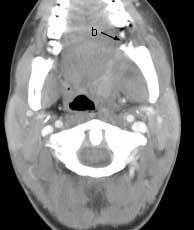 Tail of the left parotid (p).